In my Raising Readers post last month, I opened up the series to you, my readers, and asked for your unique perspectives and insights. I received emails from many of you who were interested in sharing your experiences through a guest post. Thank you so much (and if you'd still like to participate, please contact me: sunlitpages [at] gmail [dot] com). It is with great pleasure that I introduce Linnae Harper, the very first Raising Readers guest. Linnae and I met through this blog (she has been a loyal commenter for many months). We connected over our shared loved of children's literature and discovered that we have similar tastes. 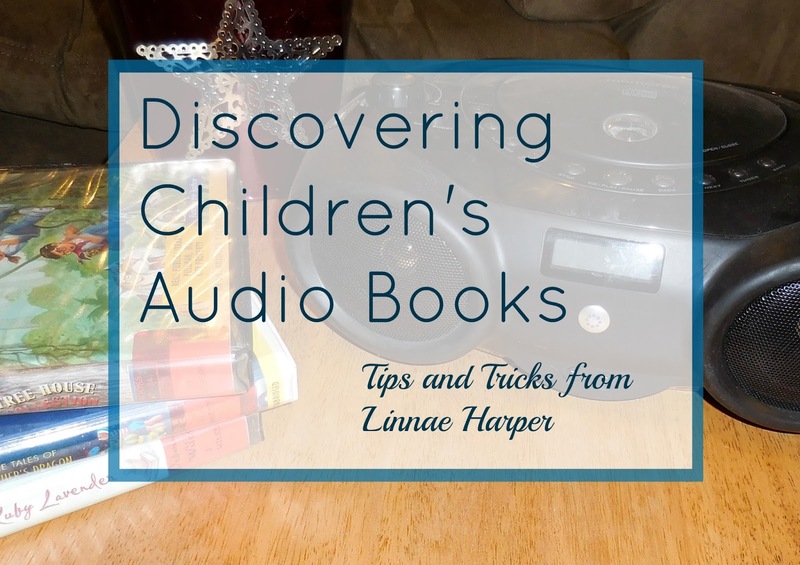 Today she'll be sharing some of her tips and tricks for listening to audio books with kids (a subject near and dear to my heart, as you might remember that my own Maxwell is an avid fan of audio books). 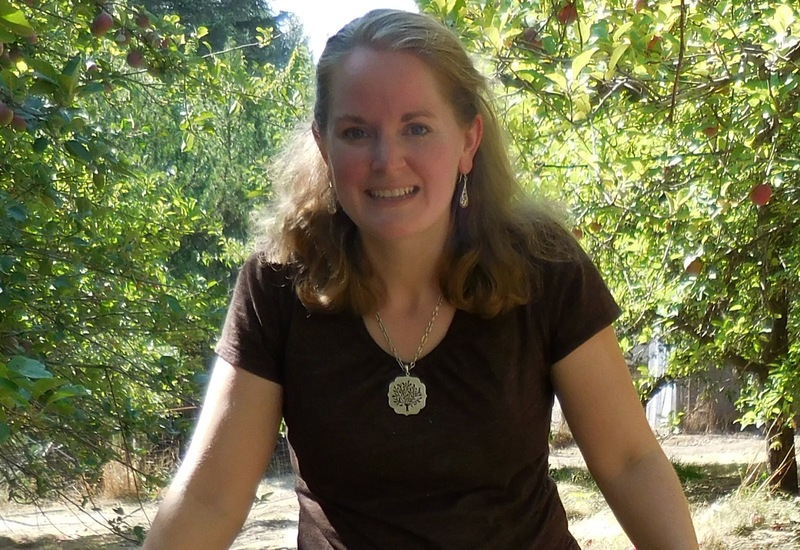 Please join me in welcoming Linnae to the blog! Hello, blog friends! I’m happy to be here on Sunlit Pages sharing my love of books. Before I had kids, I was a children’s librarian for 3 years, which was a dream job for me. I am now happy to be a full-time mom of three, 2 boys with a girl in the middle, ages 7 ½, 6, and 3. I haven’t made the leap to a book blog (yet!) but you can find my book reviews on Goodreads. It all started with a Christmas present: a $30 boombox/cd-player. It was simple enough for the kids to use all by themselves. At first, it was mostly for music. Then we checked out some picture books with narrated CD’s from our library. Then we made the leap to chapter books on CD. Before we knew it, we were having marathon story listening sessions! It’s like having an on-call grandparent, ready and eager to read whenever they want it! While I would never use it to replace my reading time with them, there are some things I really like about it. This one is obvious, but it’s been huge: I don’t have to be there for it to happen! If they want a story, but I’m making dinner or helping someone else, they can take care of that all by themselves! It’s tremendously empowering, particularly for my younger children who can’t read on their own yet. Often the CD’s include music or other sound effects which adds to the fun. I don’t have to read the same story a thousand times in a row! Let’s just be honest—there are some books where I mentally zone out on page one and my mouth just knows what to do until the end. We’ve read them THAT MANY TIMES. Listening to it again and again can also become annoying, but at least I can be actively doing something else, while my child revels in the familiar story. I call that a win! Car trips, particularly those with long twisty roads where I am too carsick to read. Simply pop in the CD and stare at those little yellow lines on the road. Done. So if you are new to audio books for kids, my biggest tip for delving in may seem counter intuitive at first: start with books you have already read to them. Repetition is comforting to kids, not boring! Already knowing the plot seems to make my kids more eager to listen to the story, not less. They’re snuggling down with a familiar friend, rather than getting a surprise. Believe me, once you find a few they like, they’ll be listening to them over and over anyway! (see #4, above). There are several of our books on CD (Magic Tree House, I’m looking at you!) that I could probably quote word for word. Not kidding. Once you find something you like, branch out with other books in the series, or by the same author. Often the reader will stay the same over a series, which will give that instant feeling of familiarity. When you decide to try something new, don’t be afraid to stop and try something else if you or they don’t like the narrator. No harm done, and probably better to not ruin a good story! Geronimo Stilton / Geronimo Stilton: My 7-year-old can’t get enough of these! Harry Potter / J.K Rowling, read by Jim Dale : If you’ve already introduced your kiddos to Harry Potter, these are excellent! The Collected Stories of Winnie the Pooh / A. A. Milne: this one is a full-cast dramatization. We loved it! Do your kids listen to audio books? What are some of your family’s favorites? We’re always on the lookout for more! Linnae grew up in Alaska, as the only girl in a family of 10 boys. Her vote always counted extra! A former children's librarian, she is now a full-time mom. She has found that many of the same skills apply. Her book reviews can be found on Goodreads under the user name Linnae Harper. My daughter is listening to Beezus and Ramona right now, but audiobooks are a new thing for her. Thanks for the suggestions! You're welcome! My kids love the Ramona books on CD. Pretty much any of the ones by Beverly Cleary have been winners for us. My kids and I love audiobooks! I love these suggestions. A question - Do you have a good source to recommend for the CDs? Do you purchase or borrow from library. and wow 10 brothers, only girl. My kids will like that, though my husband has only one sister and 6 boys in his family. Good question! We usually borrow from the library. Sometimes the CDs are scratched, but most of the time they have been okay. The ones the kids really love--like Magic Tree House, for instance--we have purchased. My mother-in-law finds them at garage sales for us, and we have bought some from Amazon. Wait. What's the proper pronunciation of "porcine"? Now I'm dying to know! I've been saying "poor-sign."